A sweet treat that incorporates a serve of legumes. Preheat oven to 180ºC and line a tray with baking paper. Cream sugar and butter until smooth. Add vanilla essence and egg and mix well. 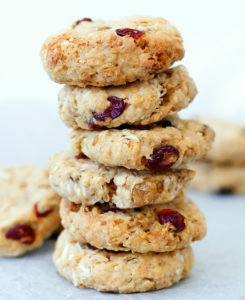 Add mashed chickpeas, cranberries, coconut, walnuts, flours, oats and baking powder and mix until all is combined. Bake biscuits for 10-15 minutes or until golden brown. Allow to cool before serving, or store in an airtight container. The additional of legumes, oats and wholemeal flour increases the fibre content.